Excursions in the taste: the typical Tuscany kitchen. the dishes most typicalof the region are very simple country receipes; wheat flour, maize flour, bread, oil, beans, milk and good wine, are the principle ingredients. The most renown local dish are Pici: a pasta of flour and water from which the cook forms the thin threads with the palms of the hands. With the same pasta (but with the addition of egg) both maccheroni and tagliatini are made. With stale bread Panzanella is made a type of salad dressed with an abundance of oil and enriched with the aromas of onion, basil and mint or alternatively Ribollita in which slices of bread are soaked in bean soup. Rivoltolo consists of flour dough cooked in oil. Until recently a type of Schiacciata was still made from maize dough, in which the rolled out dough was cooked between two cabbage leaves. Similarly between two leaves, but this time fern fronds a local soft sheeps cheese (called Ravaggiolo) is presented. Again, with bread toasted on the open fire, rubbed with garlic and anointed with new olive oil, bruschetta is made. Chickens spit roasted, duck, goose, Porchetta: pork prepared with salt, garlic and rosemary, roast capon, pheasant and rabbit are the meats which have immigrated from the countryside to the city restaurants. 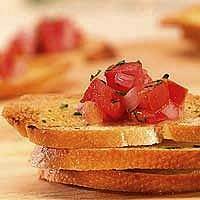 To these we must add the typical Antipasti starters such as crostini of spleen or liver, mixed dishes comprising game and mushrooms, Pansanto: slices of bread with boiled cauliflower, vinegar and oil. The much celebrated beefsteak Chianina accompanied by Ciaccia (a flat bread dressed with oil) or the typical saltless Tuscan bread (so as not to offend the other flavours). Another important aspect of our gastronomy are the sweets and puddings such as Cantucci biscuits with almonds, to dip in local Vin Santo. Il Castagnaccio and La Ciaccia dei Morti: seasonal sweets for the November celebrations, and I Crogetti: typical sweets forn Carnival time.